I started blogging on a whim – just to get in the practice of writing on a regular basis, and getting used to having other people read my words! It turned out to be one of the best decisions I could have made – and finally, after nearly a year, I’m starting to feel confident enough to begin sharing my writing with friends and family members as well. I’m also breaking out of the box that I put myself in when I first started this blog. Initially I was constrained by the idea of having a specific purpose or direction – so I focused a lot more on what I felt like I “should” be writing, and put pressure on myself to make sure I posted every day. These days, I’m much more lenient, and I certainly don’t manage to make a post a day. I’m going back to my old self and I’m just honored to take those of you who want to join in, along for the ride. So yes, this site is dedicated to all things that make me happy! And it’s still true that if you stick around long enough, you might catch a few rants as well – and of course I won’t forget to update you on the latest books in the works, what I’ve been reading, watching, listening to, and loving at the moment…But more than that I think you’ll find that where my passion truly lies is writing about people, and the many ways that life and its experiences connects us all. My goal is to become the best person I can be, my hope is that I can inspire a few others to do the same along the way. For more information about Andrea Kelly, click here to visit the “About the Author” page in the Press Box. New here? Check out these posts to get acquainted! 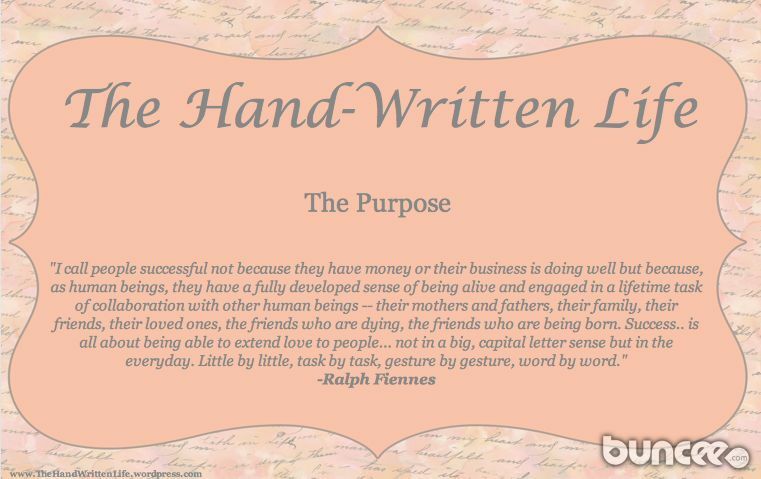 Want more of The Hand-Written Life? Like Andrea Smyth at The Hand-Written Life on Facebook, or follow Andrea on Twitter! You can also find Andrea on Pinterest and GoodReads! Thanks for the follow on my site, Andrea. I will have to check out The Adventures of Baseball and Zooey! Sounds great! Thank you! I’m having a lot of fun with it :) And I am really loving you and your daughter’s reviews! Thank you so much Patty! I have enjoyed your site as well :) I will definitely keep everyone updated, it has been a fun process! Thanks for stopping by, and for the words of encouragement :) I have checked out your blog (you have some great posts), and am definitely be interested in getting my work out there to be reviewed! At the moment I’m kind of scattered, trying to get everything together for the release of my 2nd children’s book, but I do have several copies of my work available for review. If you’d like, feel free to send me your email address at aktheauthor@gmail.com, and I’ll be sure to get a hold of you when things settle down and see if we can work something out! Thank you for checking out my blog. Good luck with the book release. I sent you an email earlier tonight. Have a great night! Thank you for following my blog. Much appreciated. Hi Andrea, Nice meeting you here on wordpress. I too have written for children (short stories) which I have yet to publish. If I can’t find an agent soon, I will be self publishing. I am interested in reading some of your stuff. Aw, thank you so much Lori! I just love you too :) Sorry it took me so long to respond – been feeling a little low these days. But I super appreciate the nomination!! Ack, I know I posted a thank you on your blog, but I meant to do one here as well! Thank you so much for the honor :) It means a lot!! Thank you for the Blog of the Year Award nomination. And since I can, I have nominated you again. http://dearmsmigraine.com/2013/04/07/blog-of-the-year-award-2012/ Congratulations! This is really lovely! I look forward to reading more. In fact, my blog has actually just recently moved (as of this month!) to a new site – I hope you’ll join me at the new location!